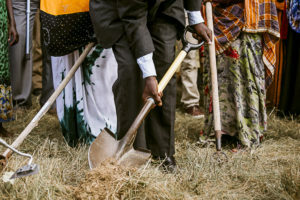 Last week, the four Somali Bantu farmers of New Roots Cooperative Farm, broke ground at their new 30 acre farm on the northside of Lewiston, Maine. 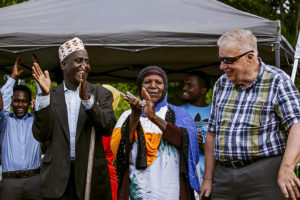 This is a dream come true for New Roots and for the Somali community in Lewiston and Maine. 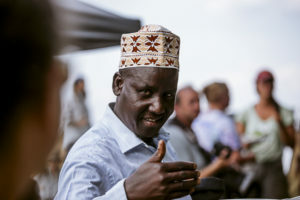 The four farmer-owners of New Roots—Mohamed Abukar, Batula Ismail, Seynab Ali, and Jabril Abdi—are originally from Somalia. 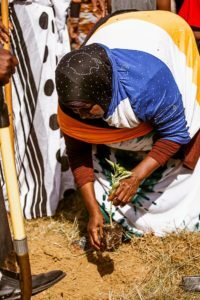 The Somali Bantu are a farming culture. When these refugees immigrated to Maine around 2005, the first thing many of them did was seek out farmland. For the past 10 years, they have farmed with Cultivating Community’s New American Sustainable Agriculture Project at Packard-Littlefield Farm in Lisbon. Over 100 people gathered in a field just outside of downtown Lewiston for the groundbreaking ceremony and celebration at New Roots Cooperative Farm’s new land. Like many American farmers, these New American farmers take pride in being able to give back to the community. Through New Roots Cooperative Farm, they will create a permanent home for their farm businesses while also providing healthy food to the community and preserving working farmland in Lewiston. Over the past 18 months, the farmers worked with several collaborating organizations to realize their dream. Cultivating Community and NASAP continued to provide the farmers access to markets and land, while also providing interpretation, logistical and coordination support to work with other organizations. The Cooperative Development Institute (CDI) worked with the farmers to develop a producer cooperative, owned by the farmers, by which they could share land, equipment, infrastructure and grow market access. Through the Conservation Law Foundation’s Legal Services Food Hub, an attorney reviewed pro bono the cooperative’s draft legal documents. Jo Barrett, Land for Good’s (LFG’s) Maine Field Agent worked with the farmers to help them determine what they wanted in a new farm, assess property options and navigate relationships with landowners. Erica Buswell of Maine Farmland Trust (MFT) took the lead on the land search, initially looking in the Lewiston area for land that met the farmers’ criteria. MFT’s search eventually led to finding and purchasing 30- acres of the former Gendron Dairy farm, which they are now leasing to New Roots with an option to purchase. To prepare for the search, LFG helped the farmers learn about land tenure arrangements, determine their farmland needs, and develop skills for working with landowners and prospective landlords. During the farmers’ land search, LFG worked with prospective farmland owners to help establish relationships with the farmers. People often say, “it takes a village,” and that was never more true or more evident than at the New Roots celebration. Family, friends, and supporters came from near and far, and from all segments of the community. The farmers thanked long lists of people and organizations who supported them, and service providers expressed gratitude for the opportunity to help New Roots Cooperative Farm put down roots in Maine. A community leader came from as far away as Enfield, CT to mark this milestone for the entire Somali community. By working together, New Roots is creating a model for an equitable food system that provides land and food access to all people. They are inspiring people in their community and people around the region to explore how they can support more New Americans accessing land and economic opportunity through cooperative farming. But it will continue to take an even larger “village” to help this new, independent farm business to get off the ground and flourish. They are reaching out to the community with a crowd-funding campaign on Barnraiser. They invite you to join the larger community that is helping New Americans put down new roots in Lewiston, Maine! New Roots will be moving to their new farm in 2017, but right now it is just an open field. They need to fund and build a vegetable wash and pack station, get connected to city water and electricity (and will also be exploring solar power), build a farmstand so the community can access their products, and build a driveway onto their farm. If they raise enough money, they will also buy a used tractor and hire a part-time marketing manager that can help them navigate different market opportunities and provide interpretation for the farmers who speak limited English. Thanks to Cooperative Development Institute and Maine Farmland Trust for permission to adapt their blog posts. You can read more on their websites and in this press coverage.